Beautiful Mediterranean style home in the private gated neighborhood of Paradise by the Sea. This home was custom built in 2015 and has all the upgrades today's buyers wish for. The large master suite as well as the main living area are found on the ground level. The open concept kitchen/living/dining area opens to a backyard oasis through a wall of glass sliders. A summer kitchen and large outdoor dining area lead to home's luxurious and unique private heated pool and spa. The home sits on just over a 1/4 acre lot and is full of beautiful tropical landscaping. 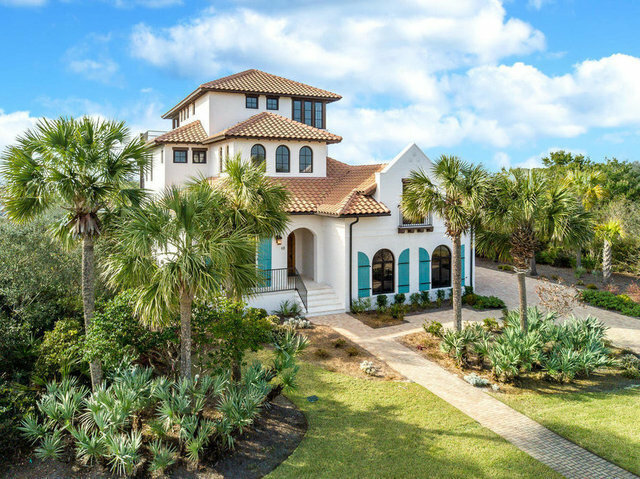 Paradise By the Sea is home to some of the most private stretches of beach on 30A, nestled between Rosemary and Alys Beach and in walking distance to all the shopping and dining of Rosemary, Seacrest, and Alys.The home features a 3 car garage with plenty of storage, elevator, fireplace, media room, central vac, and deeded beach access. It is being sold fully furnished, including a Young Chang baby grand piano, and 6 person golf cart.